Titanium Sports exhaust, Iris Navigation, Meridian surround sound system, Carbon fibre interior upgrade, Front and rear parking sensors, Electric heated memory seats, Alcantara & Leather interior, Stitching colour to dash, Titanium paintwork, Carbon front splitter, McLaren tracker, Carbon fibre engine covers, Carbon fibre engine bay panels, Carbon fibre rear diffuser, Carbon fibre side blades, Carbon fibre sills/rockers, Carbon fibre stone guards, Tyre pressure monitoring, Branded floor mats. 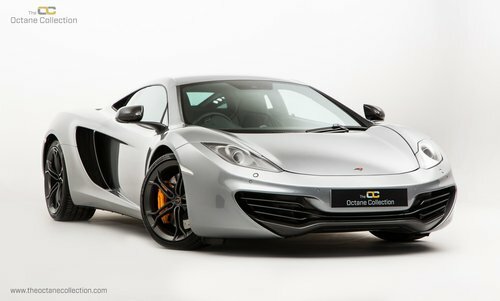 In 2008, McLaren hired Frank Stephenson as design director for their reborn production car project. 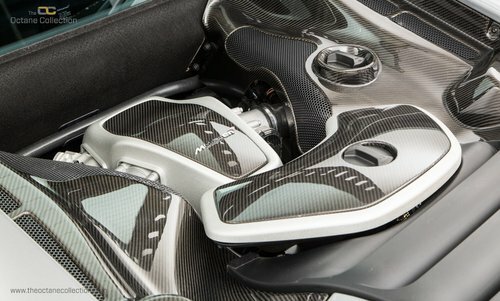 As with the McLaren F1, carbon fibre is used extensively in the vehicle to minimise weight. The MP4-12C weighs 1,301 kg dry. The chassis is based around a F1 style one-piece carbon fibre tub, called the Carbon MonoCell, weighing only 80kg. The faultless Titanium Silver paintwork contrasts perfectly against the silver Lightweight forged alloys and Carbon fibre rear diffuser. The paint work is presented in wonderful condition, free of marks or chips. The McLaren ‘swoosh’ logo is not only used to the front badging; look closer, the front headlights and side sculpture of the car is designed in exactly the same way; a truly wonderful design aspect. The body oozes aerodynamic features with intakes, vents, fins and large scoops channeling air to vital radiators, utilizing it to increase downforce and discarding anything that might slow it down. A functional design masterpiece. Once the beautifully crafted butterfly door has been raised you are presented with a beautifully crafted interior, accentuated with the use of carbon on the climate control switches, steering wheel and centre console. The interior is well equipped and can be used daily with mod-cons including Sat Nav, heated electric seats and Bluetooth. 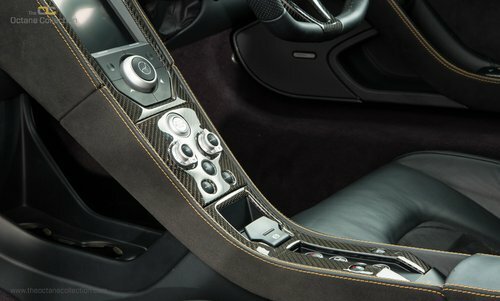 Seated low in the comfortable large leather and alcantara seats, the 12C feels like a true race car. All switch-gear is placed correctly and easily accessible; the status-quo of a non-usable super car is now over. 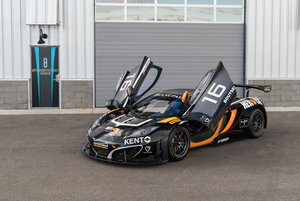 The car is powered by the M838T 3.8 litre twin-turbo V8 engine, designed and developed by McLaren, Ilmor and Ricardo. 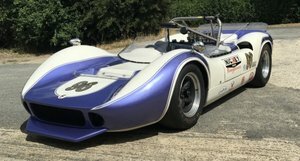 The blueprint of the engine was based on a racing engine which was designed and developed by Tom Walkinshaw Racing for the IRL Indy Car Championship but never raced. The engine is connected to a seven-speed automatic dual-clutch gearbox made by Graziano Oerlikon. Dubbed the “Seamless Shift Gearbox” or SSG, the gearbox features a system dubbed Pre-Cog that allows the driver to preselect the next gear by lightly tapping the paddle. Having been serviced just 45 miles ago and at the cost of nearly £6k, the engine bay on this example presents perfectly with nothing to fault. 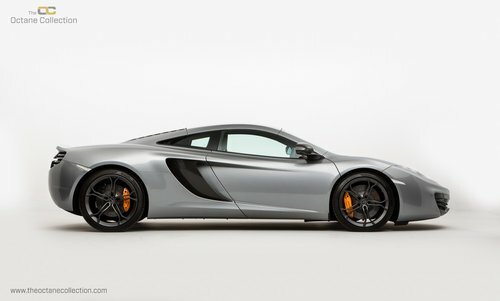 This MP4-12C sports a set of unmarked, Anthracite Grey Lightweight forged alloy wheels. The 19-inch front and 20-inch rear alloys are wrapped in Pirelli P-Zero rubber; all of which show plenty of life remaining. This example is mated to a set of steel brakes, with very little sign of use whatsoever to the brake pads and discs. 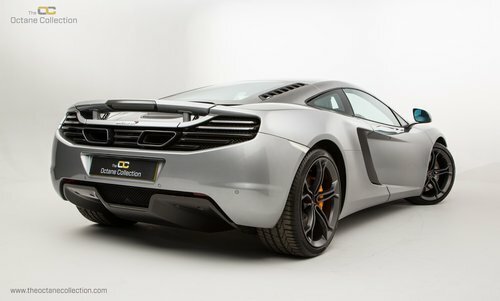 The history that accompanies this MP4-12C is quite remarkable for such a new car. Supplied on the 1st September 2011 to the current and only one owner, this MP4-12C has benefited from fastidious care above and beyond the manufactures recommendations. The service book shows 6 extensive services carried out, all of which by McLaren Main dealers. 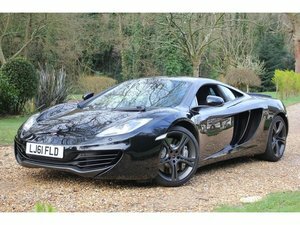 Having covered a mere 45 miles since its last service, this MP4-12C is everything you would expect from a one owner, low mileage example and is ready to be enjoyed by it’s next custodian. The history file contains the owners manual, service book, spare key and a tracker.